Asterix at the Olympic Games. The Olympic games in ancient greece had a religious significance, honoring the culture hero Heracles and were over time associated with a period of peace between city states, held at Olympia in western Pelleponnesus in the city state of Elis (Toohey et al 2007 : 13), these games were exclusively male, women could compete in the Games to Hera and it was believed that the gods influenced athletic ability. The first known Olympic victor was a cook called Corobeus of Elis who won the stade race, a running lap around the stadium which ended with contestants facing a sacred altar to honor Zeus (Toohey et al 2007 : 13). Over time the amateurism was lost and the idea of the gods influencing the outcome became increasingly suspect. Amateurism in this context means doing something for intrinsic rewards as compared to doing something for extrinsic rewards (Toohey et al 2007 : 31). The first known example of cheating in the Panhellanistic Olympic games occurred when the boxer Eupolus of Thessaly bribed three opponents to loose to him. (Toohey et al 2007 : 22). In the end the influence of the Romans was not benign, Sulla sacked Olympia to finance his army in BC 85 and Nero postponed the Olympic games from AD 65 to AD 67 to fit them into his schedule so he could compete in the chariot race and in the end failed to compete, yet he was still proclaimed the winner, thus clearly near its end it became a debacle. In AD 393 the Emperor Theodosius I abolished all pagan festivals and this included the Olympic games. Goscinny, Rene & Uderzo, Albert. (1968). 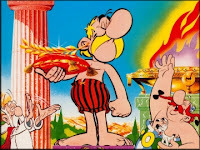 Asterix at the Olympic Games. Published by Orion. Toohey, K & Veal, A.J. (2007). The Olympic Games: A Social Science Perspective. Published By CAB international. Pages 9 to 24.